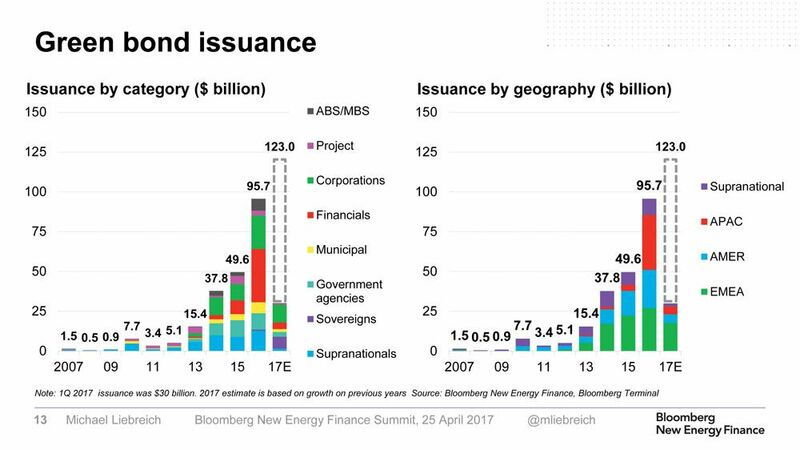 Last year, Michael Liebreich, founder and chairman of the advisory board for Bloomberg New Energy Finance, stood in front of a packed room at BNEF ‘s Future of Energy Global Summit and spoke about the record investment in clean energy in 2015. The streak would not last. 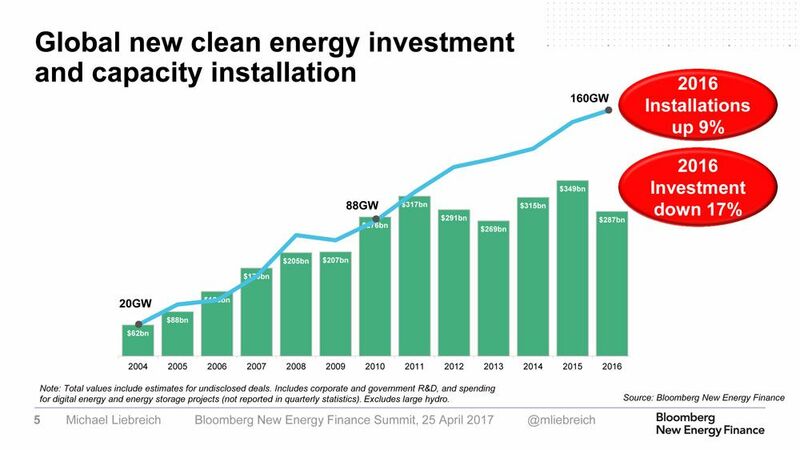 Global investment in clean energy in 2016 was down 17 percent overall, according to BNEF, driven by the slowdown of the Chinese economy and technology cost reductions. 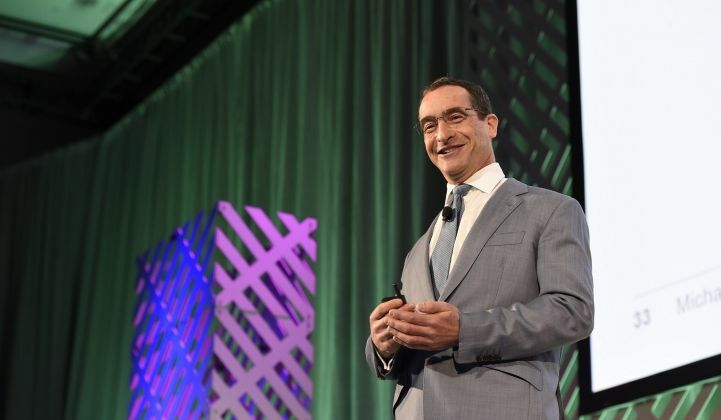 Despite the global downturn of cleantech investment in 2016 and concerns about changing political winds in the U.S., decarbonization is happening and momentum is accelerating on various fronts, according to Liebreich and others at this year's Future of Energy summit. This decidedly upbeat outlook was driven by the economics of renewables. Cost considerations by both utilities and customers are driving adoption of clean energy all over the world. Renewable energy installations are up in 2016 overall and investment in renewables out-invests fossil fuels by two to one. “This is not alternative energy,” said Liebreich. Green bonds, a market nonexistent about a decade ago, will be $123 billion this year according to BNEF, and could reach $150 billion, according to the Climate Bonds Initiative. Last November, Bank of America launched a single $1 billion green bond, nearly double the size of its previous bond of $600 million in 2015, and it underwrites scores of others. “We practice what we preach,” said Raymond Wood, managing director and global head of power, utilities and renewables at Bank of America. 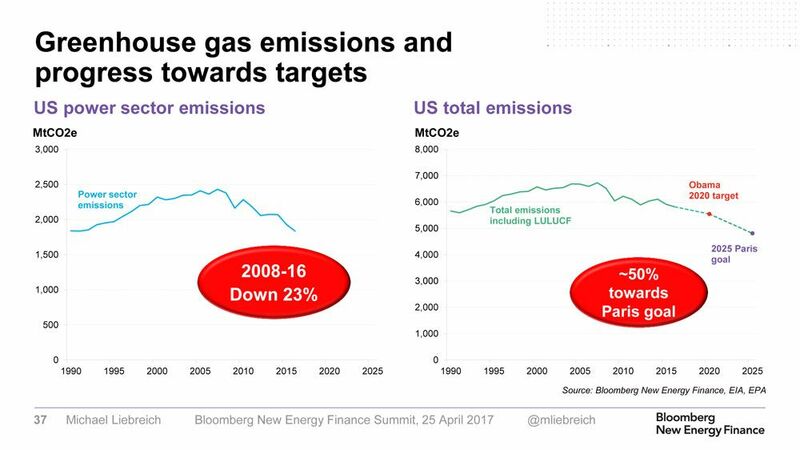 Beyond investment, the decoupling of the American economy from energy use also means that the U.S. is halfway to meeting its near-term Paris climate goals, according to Liebreich. As the U.S. has decarbonized, electricity and gas prices are down 20 percent in the past eight years, he noted. Liebreich wasn’t the only one with a positive view. “Maybe we should approach this and say the glass is half full,” said Michael Bloomberg, billionaire and former New York mayor, of action on climate change while pitching his new book, Climate of Hope, co-written with former Sierra Club executive director Carl Pope. The next four to eight years will provide “an age of plenty on steroids,” Liebreich said of the energy landscape. Cheap wind, solar, gas, coal and oil are a reality across much of the globe and energy storage costs are falling. Simply put: energy efficiency technologies and falling costs of renewables can drive decarbonization based on economics, and changes at the federal level in the U.S. will have limited impact, many at the summit argued. But cheap everything can also complicate the ability to radically decarbonize growing global economies. “It doesn’t matter how much you turn up the renewables knob; it’s very difficult to remove the last fossil fuels,” said Liebreich. That is particularly true in some developing nations where coal is still coming on-line at an impressive clip. Even so, in India, for example, some solar projects are coming in with prices cheaper than coal already. In developed nations, the key will be turning electricity capacity markets into demand-led flexibility markets, asserts Liebreich. The problem with capacity markets, as most are structured, is that they can lead to over-provisioning with inflexible load and are not incentivized to reduce peak demand. The conversation on energy market reform is already happening in some places, but there is still a long way to go. “We need to work harder on the markets and then let the markets do the work,” said Auke Lont, CEO of Statnett, Norway’s grid operator. Even with the monumental challenge of electricity market reform worldwide, significantly decarbonizing the electricity sector is probably the easy part. To meet Paris climate goals, everything else -- and transportation in particular -- needs to decarbonize. On the personal transportation front, Liebreich is also upbeat, though. “We’re very bullish,” he said. In particular, he said that once the sticker price of an electric vehicle is the same as an internal combustion engine vehicle, EVs and plug-in hybrids could meet 40 percent market share of new vehicles within five years. BNEF estimates that happening between 2025 and 2030. “This stuff can change fast,” he said.